MAKE UP FOR EVER has increasingly become one of my favourite brands when it comes to makeup that lasts and looks flawless. My favourite everyday products have been their HD Invisible Cover Foundation, HD Microfinish Powder (see review here) and their holiday holodiam limited edition eyeshadow. While I have loved the products that MAKE UP FOR EVER has brought to the table, I have always used my own set of brushes in applying the foundation, primer and other products. 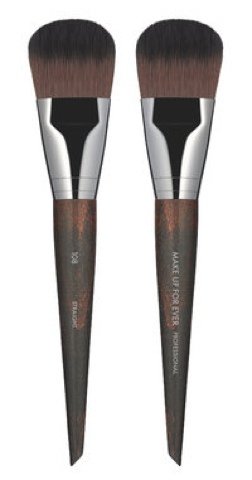 However, MAKE UP FOR EVER recently launched their “mere” 76 luxury brush collection (some products are now available at Sephora). This extensive set ranges from everyday ‘must-haves’ to highly customized tools to create the most intricate artistic effects. I was given the opportunity to try out their large foundation brush (100s collection). I usually start of my makeup routine by applying moisturizer and then squeezing foundation and primer on the back of my hand, and applying with a brush (either a kabuki brush or a foundation brush). One of the things I like about the foundation brush is that it is large, with soft but stiff bristles, making foundation application quick and easy. The collection of seventy six brushes took Creator & Artistic Director Dany Sanz and her team over five years to create. Dany wanted a variety of synthetic fibers that mimicked the silky softness of natural hair. These brushes feel amazing! A con however is that because it is a bit larger, it may be difficult to travel with, unless you’re someone who doesn’t mind taking large brushes with you. While I really do enjoy the 108 Large Foundation brush, I can't say its that different from some of the other brushes I have, but it is still a wonderful piece, especially if your are looking for a new brush to add to your collection. 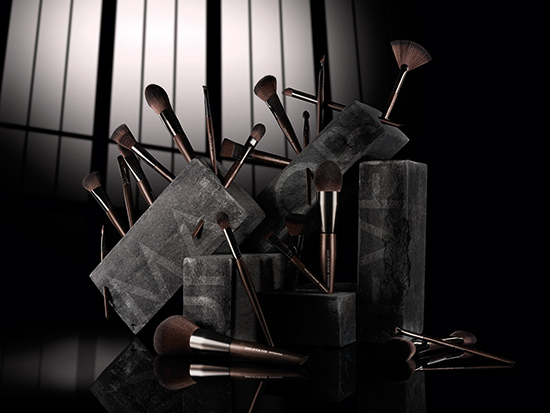 What are your thoughts of MAKE UP FOR EVER and their new Artisan Brush Collection? Have you tried any of their brushes? I have not tried any of their products before. These do look like very good brushes. I am in need of some new brushes! I've never tried any of their brushes, but mainly because I don't wear liquid foundation. BUT you have no idea how much I want to use one! I just haven't found one that my skin actually likes. Anyways, just wanted to thanks for the review and if/when I do convert, I will definitely try this brush - because I have no clue about brushes LOL. How many brushes do you recommend a person have? I've got 2 right now, one for foundation & one for bronzer...but want to get into makeup a bit more! I actually haven't tried them before but they look quite nice!